That we live in a period in history where someone with no background in website design or coding can build a great looking private practice website in a short period of time. For us as clinicians, a website is essential. But it can be intimidating if you’ve never created a website before. And it usually brings up more questions than answers. I know the thought of creating a website on your own can be scary. So I thought I’d create this step by step tutorial to help get your website up and running while avoiding the mistakes that I’ve made. I know there’s some “tech lingo” when it comes to building a website. So, before we get started, I wanted to share a few terms and explain them in easy to understand language. This is just a fancy word for the name of your website. Mine is sellingthecouch.com. This is the design for your website. It’s what makes your website visually attractive. These are things like blog posts, an about page, etc. The place where your private practice and other websites live online. This is a way to add extra features to your website. There are plugins for everything from putting SEO data to get your website found to increasing website security. A free tool that allows you to put content (e.g., blog posts, photo of you and your office, etc) on your website. I recommend WordPress over some of the other platforms out there because WordPress is much easier to scale as your business grows. I’ve broken this tutorial into 4 parts. In Part 1, we’ll learn how to pick an awesome name for your private practice website. In Part 2, we’ll select a website hosting service and install WordPress. In Part 3, we’ll install a website theme. And in Part 4, we’ll create an About page for your website. Let’s start with some factors to consider in selecting naming your website. Short. We forget longer names. Also, shorter names are easier to place on business cards and other marketing material. Easy To Spell. Hard spellings confuse website visitors. Keep it simple. The average reader is at an 8th grade level. Memorable. Try to create a website name that conjures an image in a visitor’s mind. “.Com” for website is available. “.Com” is the most popular ending for a website. If you live outside of the U.S., it’s best to secure the .com for your name as well as the “.X” for the country you live in (e.g., Canada’s is .ca). Avoid hyphens, symbols, and numbers. Other characters besides letters may lead visitors to type in the wrong website name (e.g., typing “at” when you meant “@”). This will also send traffic to other similarly-named websites besides your own. Keyword Friendly. Keywords are what others search for to find a website (e.g., counseling in Philly for example). Having a keyword like “therapy” or “counseling” in your website name helps with search engine rankings. But you’ll likely confuse visitors if you expand your career into other arenas (e.g., courses, e-books, consulting, etc. ), which is why I’m not a huge fan of having those words in a website name. Don’t worry if you can’t get a keyword in your website name (e.g., Selling The Couch has no keywords in it). There are other places you can put these words on your website (e.g., in blog posts). Avoid using copyrighted names in your website name. For example, if you’re trained in a certain theoretical orientation, it’s not smart to include it in your website name. Copyright.gov is a great place to check. Catchy and Brandable. Select a name that you can branch out from. Also, there’s evidence that a “brandable name” is a powerful influencer of higher rankings in search engines. At this point, I encourage you grab a beverage, take out 10 note cards/post it notes, and write down 10 short, easy to spell words that speak to your soul. Try to have some of these words be keywords that you want to rank for in future searches (again, this is nice but not essential). Spend some time combining these into 2-3 word phrases and see what you can come up with. Bust A Name is a cool website that speeds this process up. You can also use a website like Domainr to instantly see if the “.com” of a website name is available. Feel free to use conjunctions (e.g., and, the, etc.) to connect the words (Here’s a list of some more). Therapist and business coach Kelly Higdon, who along with Miranda Palmer form the dynamic duo at ZynnyMe, says that thinking small and not planning for future growth is a common mistake new practitioners make. So ask yourself a question as you’re completing this website naming exercise. Where do I envision my career, my life, and my practice in 5 or 10 years? Now I know that we’re not fortune tellers (wouldn’t that be awesome?? =P), but asking this question can help you filter some names for your website. Do you envision being the face of your business? If so, it may make sense to have your name as your website name. Do you envision being a solo practitioner that only wants to do counseling? If so, it may be okay to include your name and the word “counseling” in your website name. Will you add clinicians to your practice later and/or sell your practice? If so, it makes more sense to have a general website name. Do you plan on branching out from traditional psychotherapy into speaking, writing, podcasting, courses, etc.? If so, it’s better to create a name that’s easy to translate into multiple arenas; personally this is how I would lean. Do you plan on moving to another city or state or plan to offer coaching/consulting services beyond a geographic area? If so, it doesn’t make sense to include the city where you practice in your website name. I know that this is a lot of information to consider. If you need to, take a few days and come back to this guide. I’ve also found something as simple as taking a walk or taking a hot shower (this is actually how I came up with “Selling The Couch”) does wonders for coming up with a website name. 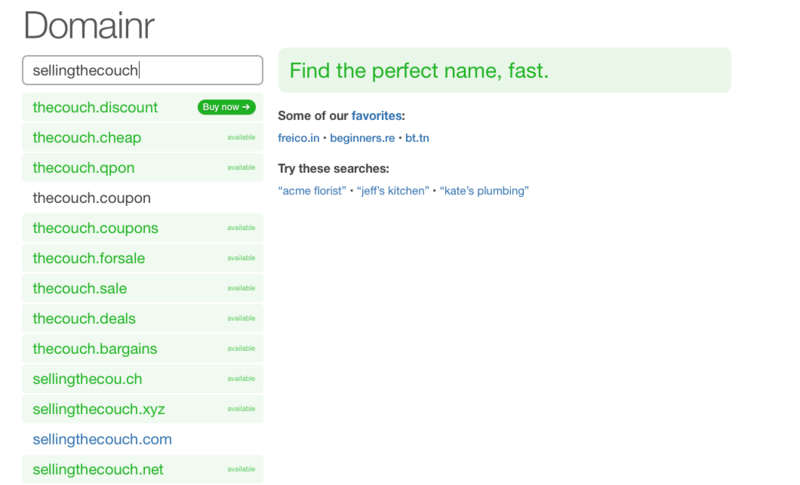 Most importantly, don’t get too stressed out about coming up the perfect website name. Your website name is only one part of building a successful presence online. Now that we have a website name selected, let’s get it registered and your website set up. But first, I have a confession to make. I didn’t pick the right website host when I initially launched the Selling The Couch blog. I mean, it was fine for the first few months (I actually picked one of the more popular hosting companies). But then, the issues starting coming. The STC blog fast to load one day and slow as molasses the next (sorry..the Texan in me just came out =p). Then in mid 2015, the STC blog crashed 5 times in a 2 week span. When I called customer service, they couldn’t explain what happened and couldn’t give me a time frame on when the website would be back up. I wanted you to be able to access the STC blog 24-7. It just didn’t feel right to continue with my previous hosting service and to continue to recommend them to you. So in late 2015, I stepped into high gear to find a new website hosting service using the hard lessons I’d learned as a guide. Based on my experience, I came up with 9 criteria in selecting the right website hosting service. WordPress allows us to put content on our websites. It’s the industry standard and trusted by over 74.6 million websites. This allows a company to earn a solid track record. Website host can handle lots of websites without compromising speed and quality for any one website. Some hosting companies sell you extra features as soon as they realize you’re interested in hosting a website through them. I’m not a fan of paying more than you need to and especially not a fan of being taken advantage of. 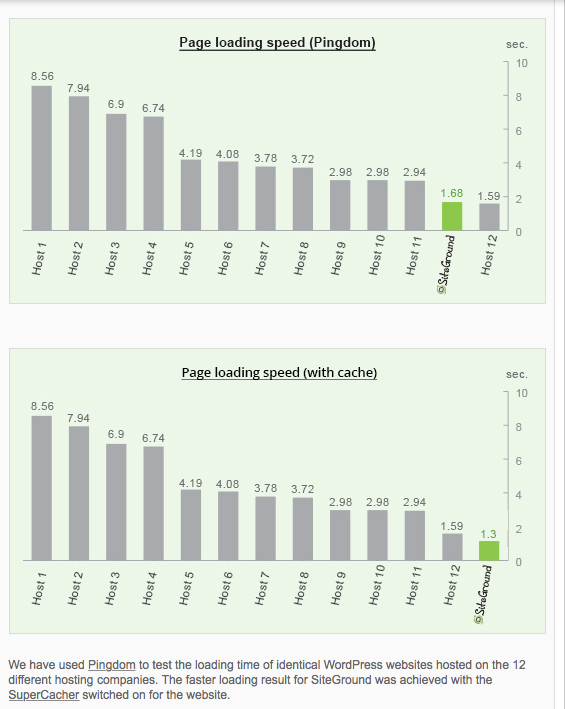 Website speed is one the main factors that affect Google search engines rankings of our websites. My previous website was really slow to load. And I know that it led to visitors leaving the website sooner and to lower search engine rankings. Visitors will access our websites 24-7. Imagine what a down website communicates to those we serve. Site Ground regularly scores high in independent tests (You can check some out HERE and HERE). Site Ground also publishes real time, unedited reviews on their website. I’ve called Site Ground several times during the day and night with various questions (someone even answered at [4:30] AM EST =p). I’ve been able to talk to a live person in less than 7 minutes each time (I took finding a new hosting service seriously and kept time =p). With Site Ground, you simply click a button to install WordPress on your computer. No need to code or download anything. Site Ground was founded in 1995 by several IT professionals. Everything I found online indicates a strong track record where customer service is first priority. Site Ground also has an “A” rating with the Better Business Bureau. As of this writing, there were 13 complaints filed within the past 3 years but all were resolved based on what I read. Site Ground hosts over 450,000 websites. I was a bit worried whether so many websites would lead to my websites becoming slower, but I haven’t found that to be the case. When companies do this, this makes me very leery. When I first called Site Ground, I was asked the number of websites that I hosted and what I envision for my website. Based on this, the customer care rep gave me a package that best fit what I needed. No more, no less. Just the way it should be. Site Ground scores among the highest when handling lots of traffic (higher the number, the better). They also publish a real-time status to make sure your website is up. Site Ground has among the highest security standards in the industry, which protects your website in case something happens but also protects your website from other websites that may have been compromised. Next, we’re going to go step by step into creating your private practice website at Site Ground and creating an About Page for your website. For full transparency, I’ve used affiliate links on this blog post. This means that, at no extra cost to you, the companies mentioned in this blog post will pay me a small commission for recommending them to STC fans. These are products I use and feel confident recommending them to you. Please know that I value the trust you’ve placed in me, am very protective of our field, and will never recommend a product that I don’t believe in just to earn some income. The links on this page give you sizable discounts off regular price on website hosting. I’m grateful for your support and use the affiliate income to offset the costs of running the STC blog, the podcast, and to support my family. Step 1: Log In to Site Ground and Press “See Plans” to choose your hosting plan. Go with the StartUp plan as it’s perfect if you only have a private practice website. If you have multiple websites, go with the Grow Big plan. You can always upgrade or downgrade later. When you press the corresponding button, you’ll be taken to a screen to create a username and password (be sure to write both down as we’ll need them later). Step 2. 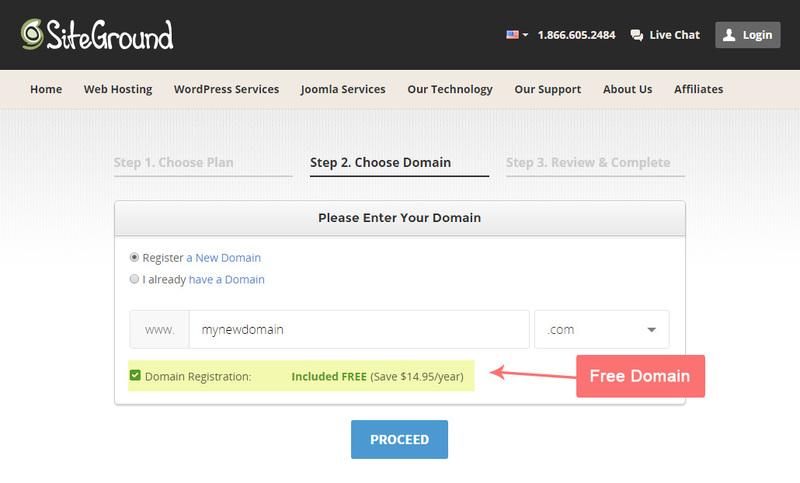 Choosing Domain Name (a.k.a. the name of your private practice website). Note from Melvin: You may want to keep your domain name separate from your website hosting service. This makes it easier to transfer your website information if you ever decide to leave Site Ground and go to another website host (I don’t envision doing this but just to be on the safe side). If you choose to go this route, I recommend first registering your website name through Hover and then selecting the “I already have a domain” option in Step 2. If that seems too complicated, call Site Ground at 1.800.828.9231 and/or Hover customer service. 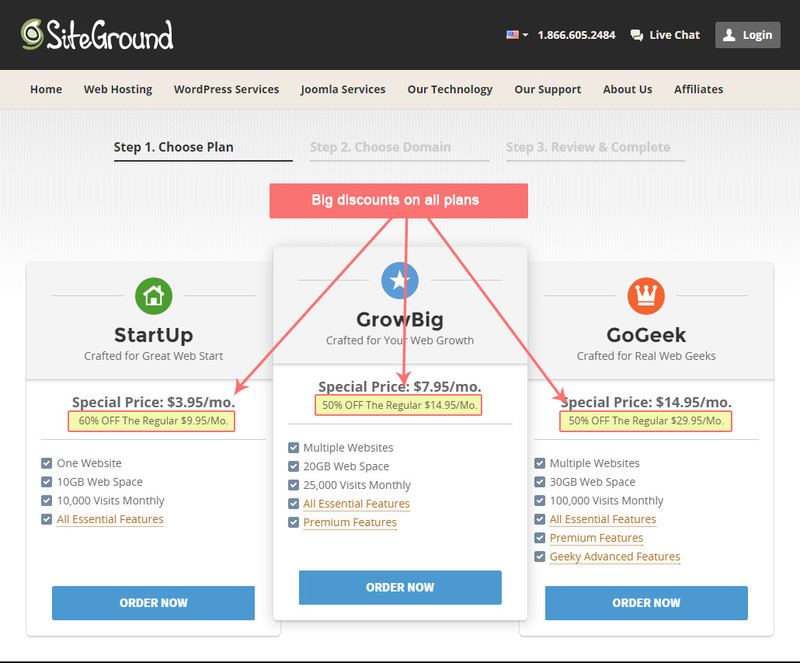 Site Ground offers discount pricing on their plans for up to 3 years. If you can afford it, I highly recommend signing up for 3 years as it’ll save you quite a bit of money. I also know that there are a lot of expenses in starting a private practice so feel free to select the 12 month option if that makes more sense now. I recommend keeping “Domain Privacy” on as this will keep your name and the address you provided private. One of the subtle, but cool features of Site Ground, is the “Data Center” option that you see in the screen shot. Basically, Site Ground has data storage centers in different parts of the world and will pick the server that’s closest to your geographic locations. 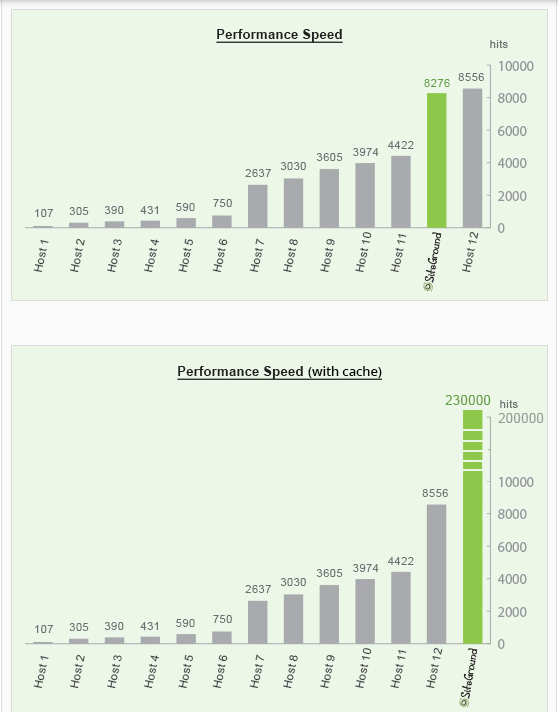 This means that you get faster speeds and a stable connection. Step 4: Check Your Email for Your Username and A Button To Log in. You’ll get 2 emails from Site Ground soon after you complete your purchase. The first email is a receipt (be sure to print/save this for tax purposes as it’s likely a write-off). The second email contains your username and a button to Login to the Customer Area. Click the button in the email, and enter your username and password (this was the password we wrote down earlier; but don’t worry if you forgot it, you can reset through a link on the email). We’ll install WordPress through the Customer Service Area. Step 5: Find WordPress icon. When you press the CPanel button, you’ll be taken to a page. You want to look for a section called “Autoinstallers” (or some variation of that). We’re looking for the WordPress icon (remember, WordPress is what’s going to add information to our websites). 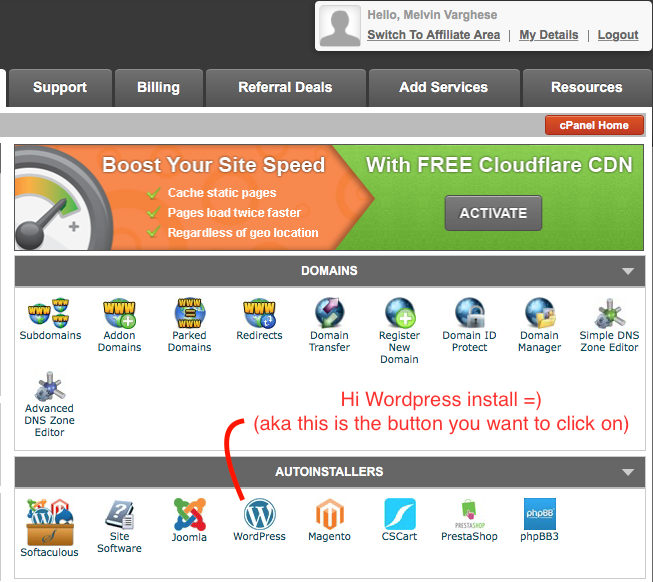 You’ll be taken to a page to install WordPress when you click the WordPress icon. Make sure the “Install” section is selected and simply select the name of your private practice website from the drop down menu (you’ll have to scroll down the page to find it). You can also set your username and password to log into WordPress on this page. Be sure to write both of these down as this is how you’ll edit your website in the future. Step 7: Log Into WordPress. It’ll take several minutes to install WordPress (now’s a great time for a beverage and a virtual pat on the back from me to you =)). You’ll get an email with a link to login to WordPress. You’ve probably noticed that your website looks pretty plain. And you may be wondering how many websites looks visually amazing. Many of them have a “theme” installed or were custom designed. WordPress comes with several free themes that you can install if money is super tight. The issue with free themes is that they don’t always get updated, which leaves your website vulnerable from a security standpoint. Instead, I highly recommend getting a premium theme. Always select a theme that website designers and developers are versed in because you may want to hire a professional developer to tweak your website once your practice is establisehd. 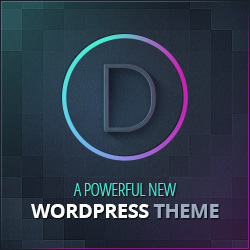 I selected the Divi Theme from Elegant Themes. I picked Elegant Themes because they’re trusted by over 300,000 websites and have a thriving 10,000 person Facebook community of users, developers, and designers that you can join to get support 24-7 (check the Files section of the group for a list of developers/designers). Here’s a link to my designer as well. I picked Divi because it allows anyone to create an amazing website using their “drag and drop” templates (I actually created this blog post using Divi). In other words, Divi comes up with pre-made templates that you can just put information into or you can create custom layouts. Divi is mobile responsive and was awarded the Sucuri Safe Theme Award after an intensive security audit. Here’s a quick video of the Divi Theme from the folks at Elegant Themes (prepare to be blown away! =p). Even thought it’s a bit more upfront, I highly recommend getting the Lifetime Access plan from Elegant Themes, which allows you to put Divi or any of other 86 designs and plugins on unlimited websites (remember, it’s likely a tax write-off as long as it’s being used for your business). Bonus tip, as of this writing, you can get 10% off the Lifetime Access plan by signing up for the Elegant Themes email list (look on the bottom right when you get to the Elegant Themes website). Now you probably won’t have 86 websites =p, but the real value is that you get lifetime access to any plugin’s that Elegant Themes makes. I really like their Monarch plugin, which is the social media sharing buttons you see on this page and the Bloom plugin, which allows you to put email sign up forms on your website with the click of a few buttons. If finances are tight, check out the Developer plan as this plan gives you access to email forms and social media sharing buttons in addition to Divi for one year. I know that installing a theme can feel intimidating so I created a video to show you what to do =). In this final video, I’ll show you how to create an About Page (the About page will likely end up as one of the most visited pages on your private practice website) and some other cool stuff. This all in one SEO plugin allows you to optimize content to get found by search engines. Protects your website comments section from spam. User-friendly plug in if you want to add a comment section to your blog posts. The plugin allows you to shorten website addresses for social media and mentioning in presentations, videos, podcasts, etc. For example, I used Pretty Link to shorten the title of this blog post to http://sellingthecouch.com/websiteguide. All in one security plug in for your website. Allows readers to subscribe to an email list by providing them “content specific bonuses” at the end of blog posts for example. I know that creating your own website can be intimidating, but my sincere hope is that this tutorial has made it much less scary for you. I know you can do this! Remember, you can always contact Site Ground’s customer happiness team at 1.800.828.9231 if you get stuck or Hover’s customer care team. If you’re a current or aspiring mental health private practitioner and need feedback on your website, feel free to join over 1,000 colleagues in the Selling The Couch Facebook Community. Once you’re done installing everything, here’s a fantastic Intro To Divi video tutorial from the folks at WordPress Examples. And here are two helpful podcast conversations I’ve had with Kat Love with some more tips on creating your private practice website and with Nicole Bonsol on crafting a heart centered About Page. smart_track_player url="http://traffic.libsyn.com/sellingthecouch/STC-Nicole_Bonsol-edited.mp3" title="Create an Amazing About Page" artist="Melvin Varghese with Nicole Bonsol" social="true" social_twitter="true" social_facebook="true" social_gplus="true" ]Finally, if you think this tutorial would help a colleague, please consider sharing it on Twitter below or through the social media links on this page (many thanks =)).